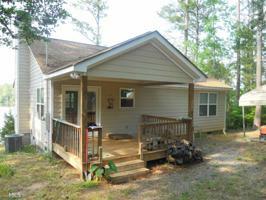 This newly built 1BR/1Bath lake home has all of the modern upgrades for todays living. Duel fuel heating, River rock fireplace, and a marble shower. Plus it is on High Falls Lake. Enjoy the beauty of this peaceful lake. The views from this home are spectacular. The sunsets are amazing. The home is very private at the end of a no outlet street. Next to the boarder of High Falls State Park. Property will be a multiple parcel sale. The parcel number that is being sold with this listing is Parcel#012A095 This parcel is .26 acres. The total acreage that is being sold in this listing will be approximately .54 acres per the county records.